Sarah Geronimo (wearing white), Bamboo (middle) and Lea Salonga (wearing blue) performed with contestants of The Voice Kids. ABS-CBN’s The Voice Kids is still the most-watched show for weekends. This is according to data based on overnight ratings of Kantar Media/TNS among Total Philippines (Urban & Rural) from July 4 to 6, 2014. 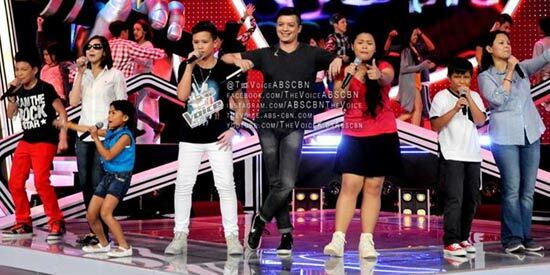 The Voice Kids was able to top ratings charts for July 5 and July 6 with scores above 30%. Two movie airings topped weekend daytime. On Saturday, ABS-CBN's telecast of The Chronicles of Narnia Prince Caspian was the winner, while GMA-7's showing of The Incredible Hulk topped Sunday. The July 4 final episode of Julia Barretto’s Mirabella registered 27.3%, allowing it to beat its GMA-7 rival show My BFF that got 10.5%. Here are the comparative Household Ratings of ABS-CBN, TV5, and GMA-7 programs from July 4 to 6, 2014 based on overnight ratings of Kantar Media/TNS among Total Philippines (Urban & Rural) households.